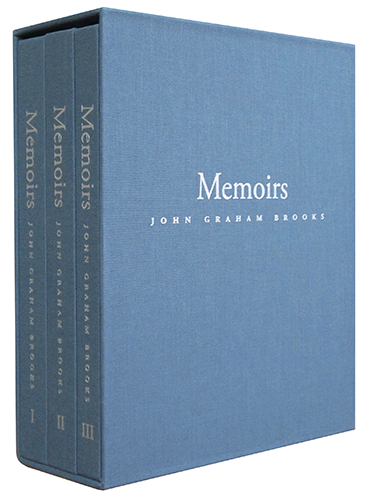 Robin Brooks at The Beauty of Books worked with personal historian Mary Littlefield to create and produce the book and slipcase design for the three-volume set, 900-page Memoirs of John Graham Brooks. Nearly single-handedly, John Brooks was responsible for bringing legal aid first to Boston, then to the State of Massachusetts, and then finally to Washington D.C. as he continued his work in his position under President Johnson. There were hundreds of images and many Notes sections, along with an extremely fascinating story.